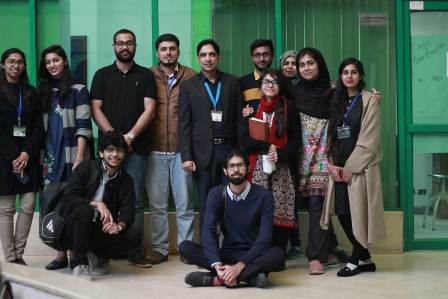 Forman Biology Society proudly hosted the Bio-Literacy Week spanning over the course of 03 to 05 December 2018. Forman Christian College has long been a pioneer in setting high educational standards in the department of Biological Sciences since its inception in 1898. Thus, the event was aimed at ensuring that our students are aware of what it takes to be a Biotechnologist and are well equipped with the required knowledge, skills and attitude which the practical world demands. Day 1 of the Bio-Literacy week saw some of our very own highly esteemed professors, mentoring and inspiring the students. 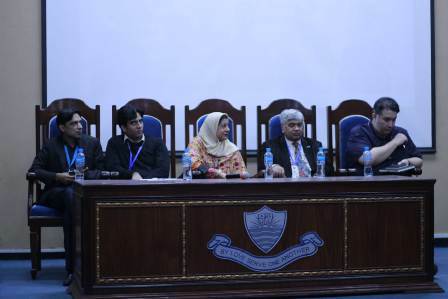 Among the panelists were the Dean of Postgraduate studies, Dr Kauser Abdullah Malik; Head of Department, Dr Samina Mehnaz; Dr Mustafa; Dr Haroon Sheikh; Dr Adnan Arshad and Dr Bilal Sadiq. The event began with Dr Samina Mehnaz introducing the growth of the discipline under discussion in the world of Academics and Industrial sector. She was followed by Dr Haroon and Dr Bilal who emphasized on the importance of knowing what you desire and the prospects of Biotechnology in the Food Industry respectively. 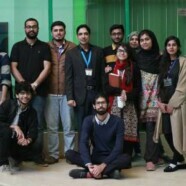 Dr Kauser, from his treasury of experiences shed insight on the introduction of Biotechnology in Pakistan and advised the students to let their creativity flow. Furthermore, Dr Mustafa carried the narrative forward by pointing out certain habits that should be internalized and the need for a progressive mindset; both of which are bound to bring success. Lastly, Dr Adnan advised the students to take their education into their hands by acquiring knowledge beyond what is imparted in the classrooms. All in all, the satisfaction level of the attendees was guaranteed especially with a very interactive and honest question and answer session between the students and the faculty. The next day was dedicated to the lovers of science and technology whose interests extend beyond Jurassic Park with the screening of a documentary, “Dinosaurs In Lab: Reality or Science Fiction” followed by another screening of “The Future of Nanotechnology” where we tried to uncover the secrets of the big problems of tomorrow through the smallest of things imaginable. We were graced by the presence of Mr H Muzzammel Rahman, former FCCU graduate, Forensic Scientist and columnist among many other things as well as Mr Imran Ur Rahman from the global enterprise Bayer, Pakistan on Day 3. Our former guest eloquently explained various fields in the world of Biotechnology, their future prospects in Pakistan as well as the work being currently done in the country while our latter guest adeptly summarized essential interview skills required to land jobs as well as the complexities of the corporate world. Most importantly, the event was able to achieve its aims of invoking hope and providing precise guidance to students who may previously have been laden with queries thus making us believe that the efforts put in by the society and all experts involved were fruitful.